The spiritual man is one who has discovered his soul: he has found his self and lives in that, is conscious of it, has the joy of it; he needs nothing external for his completeness of existence. 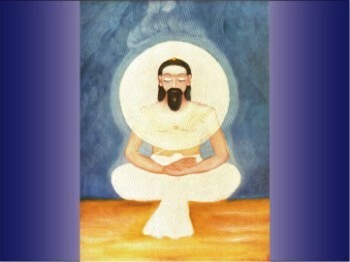 He will have the cosmic consciousness, sense, feeling, by which all objective life will become part of his subjective existence and by which he will realise, perceive, feel, see, hear the Divine in all forms; all forms and movements will be realised, sensed, seen, heard, felt as if taking place within his vast self of being. The world will be connected not only with his outer but with his inner life. He will not meet the world only in its external form by an external contact; he will be inwardly in contact with the inner self of things and beings: he will meet consciously their inner as well as their outer reactions; he will be aware of that within them of which they themselves will not be aware, act upon all with an inner comprehension, encounter all with a perfect sympathy and sense of oneness but also an independence which is not overmastered by any contact. His action on the world will be largely an inner action by the power of the Spirit, by the spiritual-supramental idea-force formulating itself in the world, by the secret unspoken word, by the power of the heart, by the dynamic life-force, by the enveloping and penetrating power of the self one with all things; the outer expressed and visible action will be only a fringe, a last projection of this vaster single total of activity. In all spiritual living the inner life is the thing of first importance; the spiritual man lives always within, and in a world of the Ignorance that refuses to change he has to be in a certain sense separate from it and to guard his inner life against the intrusion and influence of the darker forces of the Ignorance: he is out of the world even when he is within it; if he acts upon it, it is from the fortress of his inner spiritual being where in the inmost sanctuary he is one with the Supreme Existence or the soul and God are alone together. A mightier race shall inhabit the mortal's world. And lift towards godhead his mortality.